The fun, fishy tiki bar at Walt's. Everybody has his or her favorite Florida fish. Mine are hog snapper (and its snapper cousins), pompano, mahi mahi, triple tail, grouper and mullet when it is fried up fresh and crisp or smoked. When it comes to shellfish, Florida stone crab claws can’t be beat, scallops are heavenly when unmolested by an overzealous chef, Key West pink shrimp are sweet and fine, and those petite Florida spiny lobsters are underrated. Fortunately for those who live in or visit Sarasota, there are many options for satisfying piscatorial lust. From the many restaurants that do a fine job with fish we have culled nine standouts that consistently offer superior, sustainable seafood with an emphasis on fresh Gulf catches. You could easily dismiss Walt’s Fish Market & Restaurant on the South Trail, which has been a fixture in Sarasota at one location or another since the middle of the last century, as just another place to catch a bite on your way to somewhere else. That would be a mistake. The fish here is as fresh as can be, most of it locally caught and all served without fuss in a casual atmosphere indoors or out. You’re welcome to cruise the ice-chilled retail cases to see what looks best to you before ordering. On a recent visit I admired grouper cheeks, mahi mahi, frog legs (local), amberjack and other delights before being seduced by the hog snapper, the most expensive fish on offer that day and darn well worth it. Hog fish is one of the most succulent catches from local waters. Order it broiled, squeeze a little lemon over it and ignore the tartar sauce. Why trifle with perfection? 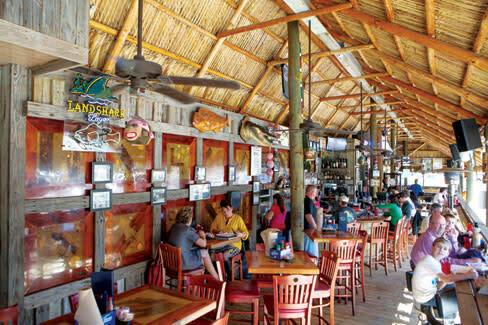 One of the best naked grilled mahi filets I’ve tasted anywhere was served in a paperboard box at a picnic table on a floating dock at Star Fish Company in Cortez, a working commercial fishing village at the north end of Sarasota Bay. The place isn’t fancy by any stretch of the imagination. You’ll need to bring your patience for standing in line to order at a window, and do remember to hit the ATM machine en route because they accept only cash. The Florida seafood served here is as fresh as it ought to be in a place right on the docks where lots and lots of local fish are offloaded daily. A couple of good hush puppies, excellent chunky cole slaw and fresh hot fries or cheese grits share the box that arrives at your table in its own good time. Relax. Enjoy the water views. The wait will be worth it. At Indigenous, chef Steve Phelps works magic with seafood dishes. 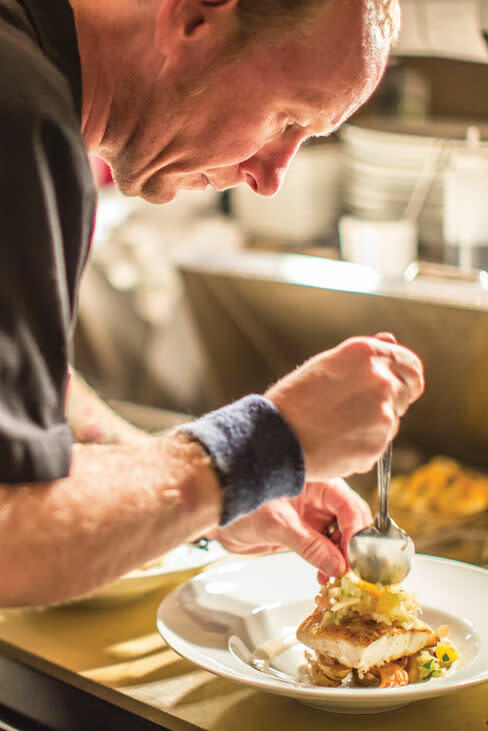 Chef Steve Phelps, owner of Indigenous in the Towles Court Arts District downtown, has always been more than good with fish, and now he’s even better. I’ll go out on a limb here and call him a genius when it comes to creating sauces that turn an already perfectly lovely piece of fish into something approaching nirvana. And he cares about fish as fish, the right fish, wild-caught local fish and fish from sustainable fisheries. Everything on the chef’s menu is pitch-perfect, from the wild mushroom bisque to the American-harvested shrimp on a bed of amazing collards, okra and polenta, but I always wait eagerly to hear the day’s special preps, of which there are always at least two. The chef’s inspired cookery is served in an utterly charming and romantic candle-lit setting, whether you sit indoors, outdoors on deck or patio or in the cozy cottage that houses the wine bar. Not surprisingly, making reservations is a must. People-watching from the sidewalk tables at Crab and Fin on St. Armands Circle is world-class, but a long and diverse menu that changes daily with the market and an impressive raw bar also are causes for celebration. The restaurant, which recently underwent renovation to open up and brighten its dining rooms, offers a fine selection of gorgeous cold-water oysters every day, a long list of fresh catches sourced both from local waters and flown in, and chef’s specials that run the gamut from crab to steak. One of my favorite starters, dating back to the days when this space housed Charley’s Crab, is Charley’s Chowder, a dark and fragrant Mediterranean-style melange of fresh fish in a chunky tomato-based broth. If you’re a caviar fan, choose from our own locally farmed Mote Marine Siberian sturgeon eggs, California white sturgeon roe or Israeli Galilee Osetra. A dining room with a lovely water view is Pattigeorge’s, a white tablecloth restaurant overlooking Sarasota Bay from Longboat Key. The flavors and fare are decidedly global with pronounced Asian influences. Fish and shellfish figure prominently. Fresh selections change often with the seasons and what comes in on the day boat. There is a full bar and a good wine list. Almost always available are a small plate of tuna tartar wonton tacos, which cradle minced ahi with wasabi “caviar” and sakimole, a variant on guacamole made with sake, and a main dish of Thai green curry grouper, which plates the local favorite with wok-tossed veggies scented with Kaffir lime and lemongrass. Worth sampling is paella a la Valencia, which combines snapper, shrimp, chorizo, chicken and mushrooms with saffron rice. If you like your fish and shrimp served with a spectacular Gulf of Mexico view, then Sandbar at the north end of Anna Maria Island is for you. This local and visitor fave has long been famous for sundown cocktails on its beachside deck, but recent renovations have transformed both the shaded deck and the bar and dining room inside, so there is no longer a bad seat to be had. Along with the makeover came a thoroughly reworked menu that now comes in two parts: standing and the day’s specials. Both emphasize local fish and local produce. A great appetizer generous enough to share is shrimp and grits, featuring pan-seared Gulf shrimp, guanciale (a sort of Italian bacon made from pork cheeks or jowl) and bottarga, a Mediterranean-style prep of mullet roe fresh from the docks at Cortez, where many daily specials also originate. Also look for produce from Bradenton’s Gamble Creek Organic Farm. Chef Dave Shiplett, who once cooked at the late lamented Poseidon and was the founding chef at Cafe Ezra, has brought a swell new restaurant to downtown Bradenton. Soma Creekside is delightfully casual and friendly and offers a varied menu, with ample attention paid to the chef’s love for seafood. The menu changes often at the chef’s whim and in tune with the market, but among our recent favorites have been a crunchy fresh lunchtime South Florida conch burger on a ciabatta roll and a dinner special of onion-crusted mahi mahi with olive picatta, grilled hearts of palm and black beans. Under no circumstances leave Soma without sampling the truffled tater tots! They are addictive. And if fiery foods do it for you, try the wok-fired peanut calamari with soy, cilantro and incendiary sriracha. Owen’s Fish Camp in Burns Court downtown is artfully funky and a whole lot of fun. This crafty take on Old Florida ambiance and Southern cooking lives in a renovated 1923 cottage under a spectacular spreading banyan tree and comes complete with rustic back porch in case you have to wait for a table, which you probably will. The place’s charm would be pointless if the food weren’t so good. One of my favorite appetizers is a pan-fried lump crab cake with slaw and lemony mayo, which goes nicely alongside a fried green tomato salad with goat cheese and country ham. There’s always a market fish special served unadorned or with your choice of lemon-caper butter or brown butter hollan-daise. When it comes to sandwiches, the fried soft shell crab BLT with basil mayo is unusual but darn tasty. And to bring out the Southerner in you, if only for an hour, have a go at the corn-meal-crusted fresh catfish with spicy collards, bacon and grits. On the south bank of Phillippi Creek in Sarasota reposes Table Creekside, a quietly sophisticated restaurant and bar with a pretty hefty romance factor whether you dine indoors or on the waterside deck. Whatever you order from the globetrotting menu will be well executed and toothsome, and Table hosts one of the best happy hours in town. There are several good options for seafood lovers, including lump crab cake with sumac rémou-lade or, going beyond the Gulf, Chilean sea bass fritters with Key lime aioli, ceviches of wild salm-on (scallions, Meyer lemon extract) or wahoo (Key lime sriracha vinaigrette), or a winning dinner of crab-crusted wild Pacific salmon with black sticky rice, baby bok choy and yellow lentil bisque. A recent special featured local mahi mahi, a Florida lobster tail and middle neck clams with a Key West bacon corn chowder.